Your foot is made up of 26 bones, 33 joints and over 100 muscles, ligaments and tendons and a lot of these are in your forefoot. 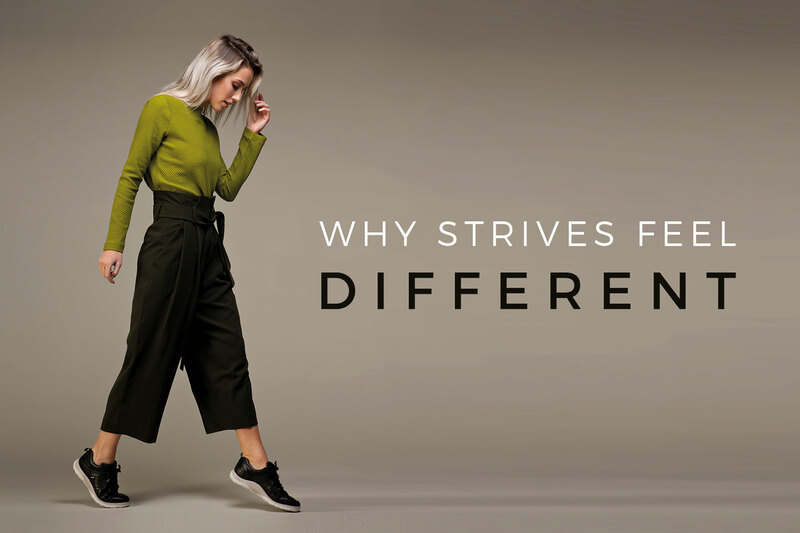 We’ve talked in previous blogs about the complicated makeup of the rearfoot and the arch and why the Biomechanical Footbed Technology in Strive footwear is so important. This month we’re going to take a closer look at why forefoot support is also crucial. Like your arch and your heel, the ball of your foot is not flat. The bones which make up your forefoot, called the metatarsals, form a gradual shallow “transverse arch”. This arch can effectively bottom out if unsupported which can lead to common problems and pain in this area (especially when walking on hard surfaces). The muscles which help to support your arch and your metatarsals are called the plantar intrinsic muscles. Research has shown that these muscles play a very important role in maintaining the shape of the foot and providing balance. Latest research is also suggesting that footwear does not weaken these muscles (as previously thought). Incorporating a “metatarsal support” into the footbeds of Strive footwear helps to support your natural forefoot arch and spread any high pressure areas over a wider area. This means that the integral structure of your forefoot is held in its optimum position which helps to prevent the stresses and strains which can lead to pain.